- The S-Series 8 is a eight inch platform bed mattress that can be used on a platform base or adjustable bed frame. The unique open-cell structure of the S-Series Serene Foam is designed so that air is filtered in and out of the mattress when you move on it. This "active air" technology makes for a cooler, dryer, more comfortable feel. TCEP (“Tris”) flame retardants. It is made without formaldehyde or phthalates regulated by the Consumer Product Safety Commission. - Founded in 1899, Gold Bond is one of the nation’s largest family-operated independent mattress, specialty sleep and futon manufacturers. The company is a leader in mattress manufacturing techniques and more than a century of experience bring product innovations, high manufacturing standards and executive leadership to the industry. - Serene Comfort Foam is made in the USA, adjustable bed base friendly, and is CertiPUR-US certified. 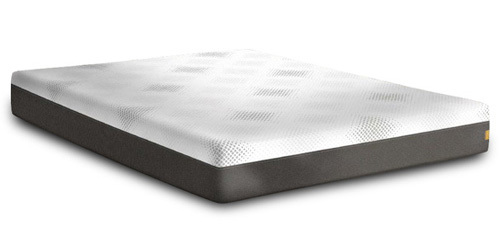 The non-heat sensitive elements in the foam keep the mattress feel consistent in all temperatures. This innovative foam uses an open cell design that feels like latex, and is more resilient and responsive than gel or visco memory foam.  Works on a platform base or adjustable bed frame.  2 inches of Serene Comfort foam with Active Air technology.  6 inches of 1.8 LB Hight Resiliency CertiPUR-US® foam.  Four way stretch knit waterfall casing.  10 year manufacturer warranty.  Made with pride in the USA.  Securely roll packed & boxed before shipping. * Size is measured before roll packaging, please allow 48 hours after unpacking for expansion. Gold Bond mattresses are made to order and drop-shipped directly from the manufacturer in 3-5 days. To Determine Your Shipping Cost: Please place the item(s) into your cart and click on the arrow next to "shipping calculator", then enter your state and zip code and click on the "apply" button, the shipping cost will be added to your total. You do not need to give any payment info to see the shipping cost. The Gold Bond S-Series mattress comes with a 10 year manufacturer's warranty against defects in materials and workmanship. Money back on returns notified within 7 days of delivery receipt. Buyer pays all shipping costs. Item(s) must be in unused condition and returned in original packaging. Return authorization required. Subject to 20% restocking fee.